Brussels – More than 75 representatives from Colombian, European and international civil society met in Brussels last week to assess the serious human rights situation in Colombia and to alert the EU and European States about the lack of implementation of the Peace Agreement between the FARC-EP and the Colombian Government. The international meeting, representing more than a thousand organisations and social movements which work in and for Colombia, has been convened by the International Office for Human Rights – Acción Colombia (OIDHACO) together with its three associated coordination groups in Colombia: the Colombian Coordination Group for Human Rights, Democracy and Development (Plataforma Colombiana de Derechos Humanos, Democracia y Desarrollo); the Alliance of Social and Like-Minded Organisations for a Cooperation for Peace and Democracy in Colombia (Alianza de Organizaciones Sociales y Afines por una Cooperación para la Paz y la Democracia en Colombia); and the Colombia-Europe-United States Coordination Group (Coordinación Colombia-Europa-Estados Unidos – CCEEU). Participants in this meeting agree, that since his arrival into Government, President Iván Duque has not shown enough will to implement the Final Peace Agreement, his proposed public policies on comprehensive rural reform, substitution of illicit crops, and the rights of victims, as well as the National Development Plan, are contrary and regressive compared to what was initially stipulated in the Agreement, and therefore endanger peace building in Colombia. Government of Iván Duque violates Colombian State’s commitment by not fully implementing Peace Agreement. In 2018, one human rights defender or social leader was murdered every 48 hours. In the last 8 months, massacres, murders and displacements have increased. There are serious concerns about the lack of financing and lack of government support for the three mechanisms of the Transitional Justice System. For example, President Duque objected to the statutory law for the Special Jurisdiction for Peace (Jurisdicción Especial para la Paz – JEP), and in 2019 allocated a budget 28% lower than had been requested for it to function. Representatives from Colombian coordination groups are emphasising that the JEP is the instrument that guarantees the rights of the victims to truth, justice and reparation, and that “it should be untouchable”. Added to this is the new Defence and Security Policy, which represents a setback in terms of human rights: it promotes an increase in militarization in rural regions of Colombia, strengthens citizen participation in security activities, promotes the forced eradication of illicit crops and closes the door on the peace negotiation with the ELN. The organisations gathered in Brussels describe how the implementation of the Peace Agreement has not only slowed down, in addition its incorrect implementation is putting human rights defenders and social leaders at risk, especially those who live in regions where there is a weak State presence or no presence at all, that is to say, where the FARC used to operate. “The State must act with urgency and expand the reach of its institutions to the most remote rural areas, supporting processes for the implementation of the agreement which are already underway and which address the structural causes of the armed conflict, and where more defenders are killed, especially those working with issues such as land restitution or the voluntary substitution of illicit crops”. For the European and Colombian coordination groups, who have organised a programme of meetings with senior EU representatives in Brussels, one of the major concerns they wish to convey is the alarming numbers of killings of social leaders and human rights defenders, as well as the setbacks in protection guarantees for this group, in particular for ethnic-territorial communities, women and LGBTI persons. According to data from the Colombian Ombudsman’s Office, during 2018, 172 leaders were killed. However, the Colombian government continues to deny the existence of the armed conflict and continues to criminalise social protest, including the current Minga Social (a mass demonstration by small-scale farmers and indigenous people in the south-west of the country, which has been taking place since 10 March). According to the latest annual report from the United Nations High Commissioner for Human Rights, massacres have increased by 164% in the last year, from 11 cases in 2017 to 29 in 2018. Forced displacements, meanwhile, increased from around 127,000 victims in 2017 to 145,287 in 2018. In light of all this, the organisations say, “we can say that Colombia is going through a humanitarian crisis”. 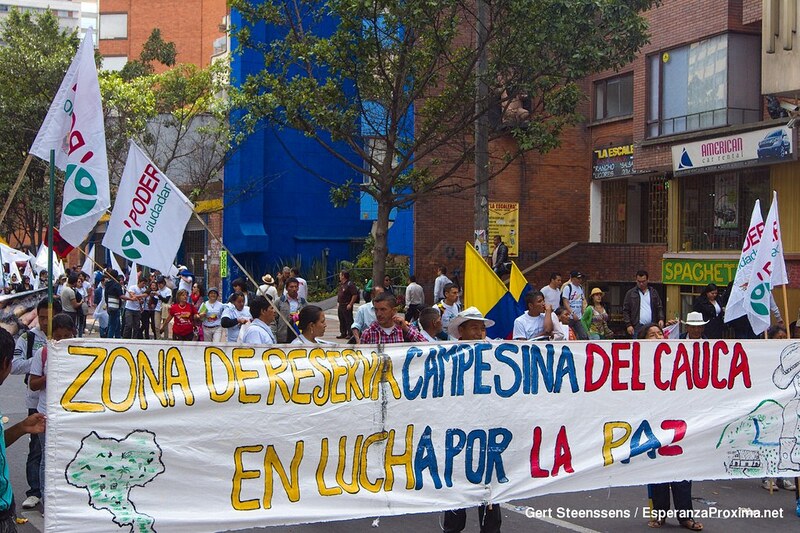 “Colombian and European organisations fear that peace is at risk in Colombia. That is why we are calling on the EU institutions and their member states to continue to closely accompany the process of implementation of the Peace Agreement with the FARC-EP, asking for the resources that they have given to be accounted for, and urging the Colombian government to maintain its commitments to the search for peace and guarantees for the victims’ rights”, they conclude.